Fiber Grow is made from coir, a highly renewable resource and 100% biodegradable. They offer all the benefits of peat without the harmful effects on the environment. In addition coir has the capacity to absorb more water, and retain it for longer periods than peat products. The mesh liner on Fiber Grow pellets is also made from natural ingredients, allowing it to break down into the soil unlike other comparable growing pellets. 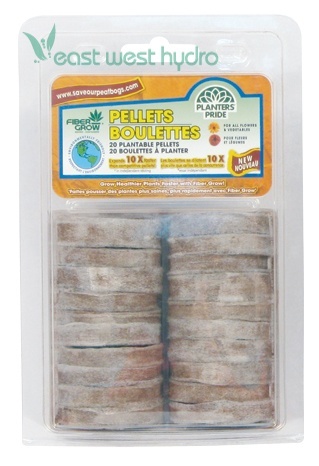 These all purpose kits include: pellets, tray and greenhouse dome. Pellets are universal, and fit in all Planters' Pride® Fiber Grow Greenhouse Kits. Dimensions: 7in. × 4.63in. × 2.13in.